NOTE: THIS IS THE EBOOK EDITION! The print edition is available to order via Etsy. Yes, it's a massive book of Harry Potter trivia. So what, you ask? There are dozens of them. Well, this book is also a flexible board-less table top game that you can play anywhere with any number of people. 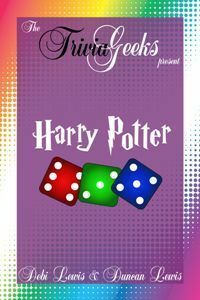 Playing with Muggles? No problem! The game easily adapts to players with varying levels of expertise. Each question is assigned a point value and optional multiple choice answers are provided. Questions are drawn from the books, the movies, and the Pottermore website and range in difficulty from Muggle simplicity to post-N.E.W.T. level. Or, you can just read it like a book. You'll find 2160 trivia questions, making it -- by far -- the largest collection of its kind. Optional accessories (colored dice, additional score cards, and a print edition) are available via the Trivia Geeks website. NOTE: This book is an unofficial collection of trivia. It is in no way formally endorsed by or affiliated with the magnificent J.K. Rowling or her business associates. It is primarily intended for those who have already consumed every shred of available information about the Potterverse and want to wallow in their utter geekiness. This title is also available at Smashwords, Etsy, Barnes & Noble, Amazon, Apple iBooks, Lulu, Kobo, OmniLit, Inktera, Scribd, and Books-a-Million.